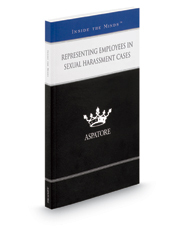 This Aspatore legal title provides an authoritative, insider's perspective on mounting a successful sexual harassment claim. Experienced partners from law firms across the nation guide the reader through the process of evaluating a potential lawsuit and effectively working with the client through its resolution. These top lawyers offer advice on distinguishing sexual harassment from other behaviors, understanding the employer's responsibilities, collecting key evidence, navigating settlement options, and overcoming common challenges. Additionally, the authors discuss important legal skills attorneys should possess and methods for staying up-to-date with key employment trends.